The impact of the Beatles cannot be overstated. John Lennon, Paul McCartney, George Harrison and Ringo Starr not only helped redefine popular music, they reconfigured the popular culture of the 1960s and beyond. Shortly after the band formed, manager Brian Epstein hired fellow Englishman Bob Whitaker to be the group’s official photographer. It was a wise choice, since Whitaker had a keen eye for framing a shot. He took thousands of photographs as he documented John, Paul, George and Ringo in their day-to-day activities. His photographs were different from many of the others that were taken because he not only understood the Beatles, he had a sense of what made them different, exciting and charismatic. His images chronicled the very essence of the Beatles. Whitaker was collaborating with the editors of Life just before his death in England in the autumn of 2011. Despite his absence, work to complete the project continued. The result is not just a treasure trove of images, but also of Bob’s reminiscences of the Beatles as he knew them. Because Whitaker was so intimately involved with the group, the photos reflect the remarkable chemistry of the four musicians, preserving even the tensions and occasional difficulties. Although some of the images will be familiar, others will not. In fact, many of the photographs are appearing in print for the first time. 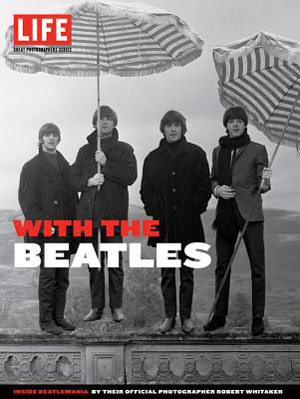 “LIFE With the Beatles” begins with an explanation of the mania that surrounded the group. The main portion of the book is divided into three important years: 1964, 1965 and 1966. For older readers, the pictures and well-crafted text certainly will trigger memories. For others, it will explain how four talented young men from Liverpool changed popular culture and allowed us to see and experience things in a fresh, new way.